Change things up on your next pizza night with homemade cornmeal pizza dough. It’s full of flavor and gives a unique crunch with the need to over bake your pizza. So I love pizza just a little bit. Who doesn’t? And if you say you, well… too bad because today is another pizza day! Yippee. Pizza pizza. Plus I figure since pizza nights on average usually take place over the weekend, it’s best to share a new recipe with you before then so you can make it. Right? I have my favorites, like I’m sure anyone does. Mine happen to be bacon and bbq chicken pizza (for obvious reasons… I mean helloooo there’s bacon!) and classic pepperoni pizza (but not just any pepperoni… thick pepperoni that form perfect little cups filled with hot pepperoni grease om nom nom). So even though I have my favorites topping wise, I’m always game for changing up the dough and trying something new. I was slightly skeptical about cornmeal in pizza dough until trying this deep dish pizza. I was definitely pleasantly surprised, clearly, given that I’m sharing a recreation of it today. It’s full of flavor and has a nice crunch without needing to be over baked. Because I like a nice crisp pizza on most occasions, or at least the outside. No doughy, soggy or soft pizzas here. Thin and crisp, all the way! Of course unless I’m doing take out but that’s a whole other story for another day. Thin and crisp with a unique flavor and texture. 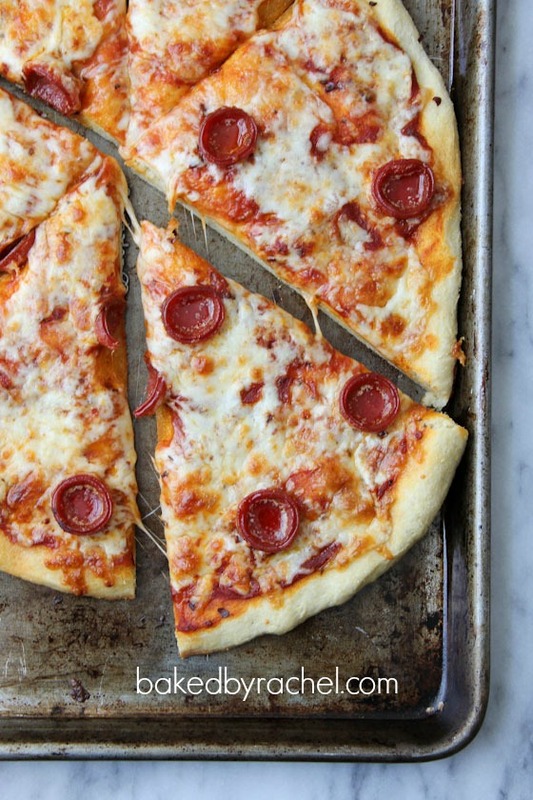 Switch things up on your next pizza night with a fun new and very easy to make pizza dough! 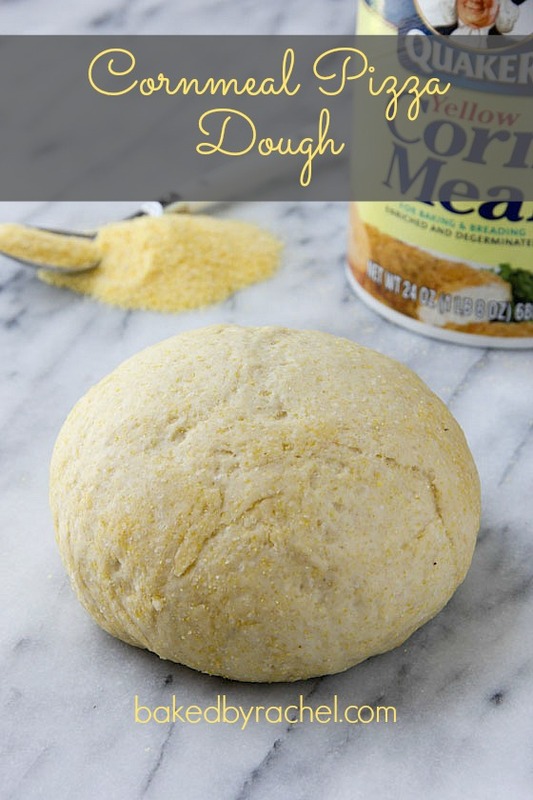 Cornmeal pizza dough gives great flavor and a nice crunch without needing to over bake your pizza. In the bowl of a stand mixer with dough hook attachment, mix together salt, cornmeal and flour. With mixer running on low, add liquid ingredients. Mix until dough forms a ball and pulls away from the side of the bowl. 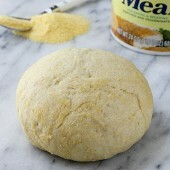 Add additional flour a spoonful at a time as needed until dough is no longer sticky. Shape into a smooth ball. Transfer to a lightly greased bowl. Cover and allow to rise in a warm location until doubled in size. Preheat oven to 450 degrees. Shape dough into desired shape on a lightly greased baking sheet. Add desired toppings and bake for 12-15 minutes. Slice and serve warm.